AUNT RUTHIE is named after Rachel's aunt Ruth Adler. AUNT RUTHIE is a bitone with light peach-rose petals and lighter sepals. AUNT RUTHIE has a crinkly, toothy outer edge with a very green throat. Fertile both ways. AUNT RUTHIE is producing very nice toothy kids. TET 5.75" SEV M Re 28" 3-way branching, 20 buds. BLACK-CRESTED BULBUL is named for one of the many birds that I saw in Thailand over the winter. BLACK-CRESTED BULBUL is a cream yellow with a very dynamic black maroon eye and edge. A nice green throat. Fertile both ways. TET Blue 7.5"-9" SEV EM Re 35" 3-way branching, 20 buds. BLUE BOX is one of my giant blue-eyed flowers coming out this year. We've measured this at 9 inches. BLUE BOX is cream lavender with a blue-purple eye and edge and yellow-cream outer edge. Green throat. Very fertile both ways. TET UF 8.5" SEV E Re 30" 3-way branching, 20 buds. 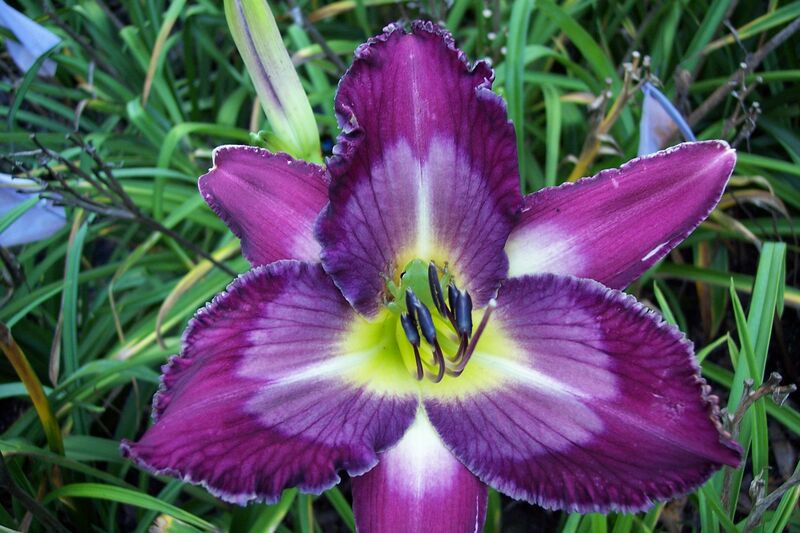 BLUE-EYED OCTOPUS has been an "oh wow" for everyone who has seen this fabulous daylily. BLUE-EYED OCTOPUS is a UF cascade with medium purple on petals and sepals with a large otherworldly wow blue eye. Green throat. Fertile both ways. TET Blue 5.5" SEV M Re 27" 3-way branching, 35 buds. BLUE PITTA is named for a very difficult to see ground bird that I also saw in Thailand. But when you do see it the blue is amazing. BLUE PITTA has cream petals and sepals with a giant distinctive, gorgeous blue eye and edge. The outer edge is a crinkly cream. Green throat. Fertile both ways. Gorgeous kids! TET Sculpted 6" SEV M Re 32" 4-way branching, 25 buds. CARVED CORAL is a beautiful sculpted pink coral relief with a nice ruffled cream edge. The green throat goes out onto the sculpting. Fertile both ways. TET 5.75" EV E Re 28" 3-4 way branching, 25 buds. What distinguishes DECO DUDE is its extra rich color. DECO DUDE has medium to dark purple petals and sepals with a stunning chalky gray-purple eye and edge and serrated cream-yellow outer edge. Green throat. Fertile both ways. TET 6.5" SEV M Re 29" 3-way branching, 20 buds. DORIS GERE is named in honor of my wonderful Aunt Doris. DORIS GERE has medium purple petals and sepals with a magical chalky purple eye and serrated edge. Green throat. Fertile both ways. TET 6.5" SEV E Re 38" 3-way branching, 25 buds. ELECTRIC LIPSTICK is one of those flowers that give you a big kiss early in the morning. ELECTRIC LIPSTICK has cream rose petals and sepals, a very large red eye and edge and a wild crinkly gold outer edge. Green throat. This dramatic bloom is producing very distinctive kids. Fertile both ways. TET Sculpted 5.75" SEV M-MLa Re 36" 5-way branching, 50 buds. GROOVE-BILLED ANI is a Central American bird that is rarely seen in the southern United States. GROOVE-BILLED ANI is a medium purple sculpted relief with a gray-purple eye and edge and a very ruffled outer cream edge. Green throat. Very fertile both ways. TET 6" SEV E Re 38" 4-way branching, 30 buds. LINED IN LAVENDER is a fascinating bloom of cream lavender petals and sepals with a blue-lavender eye and edge which is outlined in amethyst. The creamy outer edge consists of crinkles, ruffles and teeth. A very green throat. Fertile both ways. TET Pattern 6" SEV E Re 28" 3-way branching, 20 buds. PASTEL PATTERN Is another great kid from FOUR EYES with cream petals and sepals and an ethereal patterned eye of amethyst, light blue-purple and gray. A big green throat. Very fertile both ways. TET Toothy 5" SEV EM Re 24" 3-way branching, 20 buds. PULLING TEETH is a very toothy bitone with very light peach-yellow petals, lighter cream sepals and wild gold teeth and tentacles. It has a dark olive green throat. Very fertile both ways. TET Toothy 6.25" EV M Re 40" 3-way branching, 25 buds. The SIAMESE FIREBACK is the national bird of Thailand. It is a magnificent pheasant! SIAMESE FIREBACK has extra wide magenta petals and sepals with a chalky halo and large bright white teeth. Green throat. Very fertile both ways. TET Pattern 5" SEV EM Re 38" 3-way branching, 20 buds. SMALLVILLE is a bright white cream and has a fantastic patterned eye of fuscia, gray-violet and blue-gray. SMALLVILLE has a kryptonite green throat. Fertile both ways. TET Blue 7" EV M Re 34" 3-way branching, 20 buds. One look at TARDIS and you can go anywhere in the universe. This is another one of my gigantic blue eyed and edged flowers this year. TARDIS is a medium purple on petals and sepals with a very large gray-blue eye and edge and has a ruffled cream-gold outer edge. TARDIS has a green throat. Easily fertile both ways. TET UF 10" SEV E Re 40" 3-way branching, 25 buds. TOTEM TOWER seems to never stop blooming! It is a very large medium lavender UF cascade with a faint blue-purple eye and a nice big green throat. Fertile both ways. TET Blue 5.75" SEV EM Re 30" 3-way branching, 20 buds. Named for another spectacular bird that I saw in the mountains of Thailand, ULTRAMARINE FLYCATCHER is a spectacular medium purple with a very rich dark ultramarine eye and edge. Some of the blooms on ULTRAMARINE FLYCATCHER have a dark blue-gray look to the eye. A rich green throat. Fertile both ways. TET Toothy 6" SEV E Re 29" 3-way branching, 20 buds. WHISKERED TREESWIFT is a very unusual toothy of pink-cream petals and sepals with a medium pink eye and edge. The outer edge is composed of cream and pink teeth. Green throat. Fertile both ways. DIP 7" SEV E Re 50" 3-way branching, 20 buds. ART GALLERY CURLY-Q is a bitone UF Crispate with rose-lavender petals and cream rose-lavender sepals. A light gray-blue eye goes into a large brilliant green throat. ART GALLERY CURLY-Q is producing oddball diploid UFs. Fertile both ways. DIP 6.5" SEV E Re 34" 3-way branching, 25 buds. 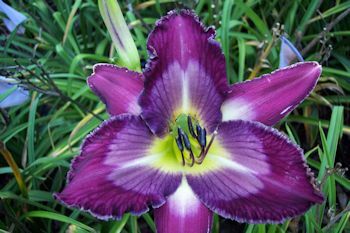 BI-COLORED BLUES has medium lavender petals, violet cream sepals and a big blue purple eye. BI-COLORED BLUES also has a wild three-dimensional white midrib running through its petals. Green throat. Fertile both ways. DIP 6.5" EV EM Re 27" 3-way branching, 30 buds. EMERALD DOVE is named for a metallic green dove that I also saw in Thailand. EMERALD DOVE is a large pale cream with extra wide petals and sepals. EMERALD DOVE has an ethereal light violet halo and a giant green throat. Fertile both ways. DIP 6.5" EV EM Re 40" 4-way branching, 35 buds. This magnificent bird was seen on Similan Island off the coast of Thailand. GREEN IMPERIAL PIGEON is a large yellow cream with a pale violet midrib and a super large green throat. Very fertile both ways. DIP 6" SEV EE Re 42" 3-way branching, 25 buds. KISS THE SKY is a complex bloom of cream rose petals and sepals with an amethyst, gray, and blue patterned eye. There is a cream outer edge and veined green throat. Very fertile both ways. Extra cool kids! DIP 8.5" EV MLa Re 40" 3-way branching, 20 buds. This enormous daylily has amber-peach petals and lighter sepals. MIGHTY MOTH has a huge patterned eye ringed with fuscia, gray-violet and violet. A large green throat. Fertile both ways. DIP 5" EV E Re 34" 4-way branching, 35 buds. PERIWINKLE PATTERN is a light lavender-rose on petals and sepals. The patterned eye is amethyst, light gray and periwinkle with a nice green veined throat. Fertile both ways.